Cupcakes 'n Daisies: One Last Christmas Tree . . . . . . .
One Last Christmas Tree . . . . . . . Hello!! I am so glad it's Monday, the Monday after the holidays. Oh I had a great time and all, but I'm a schedule type of person, and I've not been on my schedule since December 23rd. I've been on everyone else's schedules. Well things are getting back to normal around this household and I'm feeling good about having some time to myself. Although, wouldn't it be great if Christmas and New Years Day always fell on Friday? Wasn't it nice to stretch out each holiday over the weekend? Surprise, I finished "Oh Christmas Tree"! I did not get it done on New Years Eve like I had hoped, but did finish it up New Years Day. I'm happy with the end result. 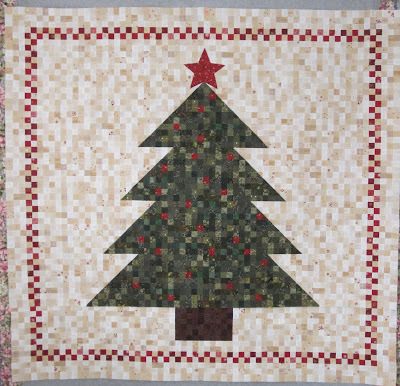 This quilt deserves the name, "Oh Christmas Tree". It's as regal as the song. But to me this quilt will be "Little Bits and Pieces" because I made this quilt from little bits and pieces of fabric using little bits and pieces of time. I started this project December 1st. It was the perfect project to work on during the holidays. I'm lucky in that I have a dedicated sewing room, so while the rest of the house was undergoing a Christmas makeover and hosting guests, friends, and family, my sewing room was unaffected by the brouhaha. This was a perfect project for sewing in small intervals. I never had to stop and figure where I was or what needed to be done. It would take around 15 minutes to piece one row. Sometimes I wouldn't have 15 minutes to spare but would at least select my fabric and be ready to sew a row when I would have the time. On the days I had more time, I connected the rows. I loved watching the quilt grow, row by row, branch by branch. Squeezing in a little sewing time through the hectic days of December was therapy for my soul. The biggest lesson for me, who usually sews at least 2 hours everyday, is that doing a little bit really adds up over time. I would not have been able to finish this quilt on New Years Day if I had not made an effort to do something, even if it was just a little something, through the month. When I started I was not 100% sold on my greens. I had a hard time coming up with good greens. I didn't have the number I thought I needed for a good scrappy look, but I'm happy with it now that it's done. The creams were a breeze, I had plenty to spare. I've already decided what I'm going to do with this quilt. Next year I would like to hang this quilt on the wall next to the mantle, to the left. This picture only shows a small portion of that big blank wall. It goes up another 6 feet. How I'm going to get that quilt to hang there I don't know, but I have 11 months to figure it out. This is Quilt #54, is 66 X 75, and has 4,950 pieces. 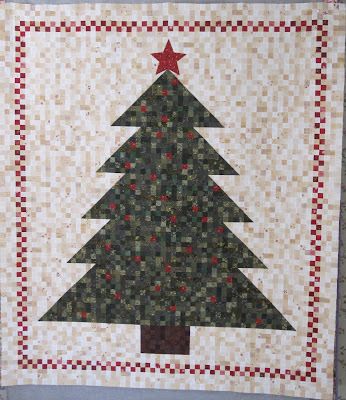 If you were too busy to read my blog as I worked on "Oh Christmas Tree", select "Quilt # 54 Oh Christmas Tree" in the Category List to the right. Applause, applause - it's fabulous! Way to go! A wonderful variety of greens! Perfect. Great job. As for hanging - how about a decorative rod mounted on those Command hooks? Wowee - I cannot believe you got that pieced in just a month's time. So many pieces! I love how it turned out. That quilt is absolutely gorgeous! Jane and I both bought the pattern a couple of weeks back. I think I'm going to start pulling and cutting here soon. 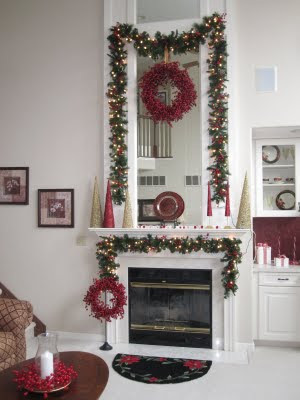 It will be stunning next to your fireplace! Congratulations on getting it done. That will be one AWESOME decoration next year. It really is beautiful. I don't have close to the number of either colour to make one but some day I think. Thelma, it is beautiful! I really like the way it turned out. I was thinking about getting that pattern to make for next Christmas...until you mentioned how many pieces ;-)) Maybe I'll go for a smaller version. You are right about the sewing time adding up. I'll have to keep that in mind as well. I have a dedicated sewing room as well, but didn't use mine to its full advantage this holiday season. Hope your holidays were wonderful. Happy New Year! You did it! And it is another awesome work to add to your repetoire! Tell me, what was the size of the individual squares? Beautiful, just beautiful. 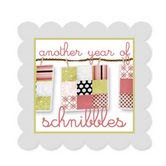 Love the scrapiness and color choices. When you are tired of it, I, for one would love to have it! Ha ha. Now I may have to add this to my list. Great job and thanks for the inspiration during the holidays! wOw! I love this quilt and I love that you know exactly how many tiny pieces are in it. I can't wait to see it hanging up by your mantle next year. Thelma it is absolutely spectacular! You did and incredible job! Love the greens. I love it !! . . . just beautiful . . . all those small pieces . . . gorgeous !! and I really like your blog too . . . 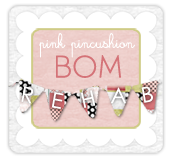 I am brand new to your blog by way of Nicole's. I am fascinated with your Christmas Tree quilt. I read all of your posts re: the quilt and do you know what I think? I think you should be designing quilt patterns!!!! Your work is awesome! You are doing great work, I love the way you made the quilt your own--especially the border. It is perfect!! I will be checking in again. Another Addition to Lifetime Quilt List . . . . In a Bind....er . . . . . . I See a Pattern . . . . . . . . Some of this, A little of that . . . . . .
Quilt Soup . . . . . There's No Place Like Home . . . . . .
State of Grace . . . . Goose in the Pond . . . . . . Patterns . . . . . Vanilla Stars . . . .